Eight shows, from 16 to June 28 at the National Theatre. Opera Cavalleria Rusticana. Will be presented in eight performances, between 20 and 30 June at the National Theatre. The presentations will count with the participation of the National Symphony Orchestra, the National Symphony Chorus and ten opera singers under the musical direction of Mexican Enrique Patrón de Rueda. June: Sunday 16 and Sunday 23 at 5:30 pm. Will be five functions, which will be presented independent ten groups selected and six guests, all excellent examples of Costa Rican dance. The functions are performed during two weekends: Saturday 3rd, Sunday 4th, Friday 9, Saturday 10 and Sunday 11. Tickets are available at the ticket office Melico Salazar on Monday July 29, and have a cost of ¢ 5000 ¢ 3500 colones general students and citizens of gold. Will be five functions, which will be presented independent ten groups selected and six guests, all excellent examples of Costa Rican dance.The functions are performed during two weekends: Saturday 3rd, Sunday 4th, Friday 9, Saturday 10 and Sunday 11. Tickets are available at the ticket office Melico Salazar on Monday July 29, and have a cost of ¢ 5000 ¢ 3500 colones general students and citizens of gold. Activity is free; Conference on biodiversity and development by Cristian Samper, director of the Wildlife Conservation Society. Space is limited. Inscriptions in www.ots.ac.cr. This is an initiative of the Organization for Tropical Studies and the National Museum. You can not stop laughing! International and national actors will make us have a good time with his humor. The Kings of Comedy is a familiar show in Spanish and English with monologues based on customs of Costa Rica, current issues, couples and more. The band Time Machine will be responsible for playing the most famous songs of one of the most iconic rock band of the 70's. Cover: 2000 colones. Organized by: Mundoloco Productions. El Chante is located in the southwest corner of the Bank, in San Pedro. Bar The Wall, is located in the Mall Heredia, diagonal to Mabe Road Heredia. The Philharmonic has prepared a very full season this 2013 playing original concerts of various genres. This time is the turn of mariachi mexican music with the sound of classical instruments. A cultural activity to enjoy with family. The imposing sound of the Philharmonic of Costa Rica to the beat of the mambo, bolero, rumba, guaracha and cumbia. The Santanera Sonora is one of the most famous Mexican tropical music. Definitely a unique concert! Produce: Association Gold Crown inputs 14mil to 32mil colones. The Costa Rican actor Hernán Jiménez offer four more functions of his new show "Vamos por partes". The American band Aerosmith for the third time visiting Costa Rica as part of his tour "The Global Warming". The responsible for opening the show will be the alternative rock group Akasha. BLACK SABBATH will present in Costa Rica as part of his Latin American tour to promote "13", their new album, which will also be present in Chile, Argentina, Peru, Brazil and Colombia. And as if that was not enough MEGADETH will accompany them in this long-awaited concert by all ticos metalheads. Black Sabbath will be presented with the original lineup headed by the legendary Ozzy Osbourne, Geezer Butler and Tony Lommi. "13" is the first studio album from the band since 1978 "Never Say Die". Tickets from 18.000 to 70.000 colones. The quintet will perform original music and standards, introducing two new members. Oscar Vega (saxophonist and music teacher), Winston Washington (pianist, singer and actor), Lotfi Hajaji (bassist and film student), Chema Garcia (guitarist and teacher) and David Bolaños (drummer) say they are very excited with the addition of colleagues to the project. The tickets will cost 2500 colones 3000 pre-sale at the event colones. For more information and reservations can contact them on the facebook page of the band. Raffle tickets are among those who give "Like"
Ginoble Gianluca, Piero Barone and Ignazio Boschetto, who have become world-renowned for his impressive vocal talent, coming for the first time to our country to a meeting with the romantic music lovers, presenting his latest album: “Más que Amor” (More than Love). According to the same singers the main message is to convey their love for music, couple love, for God and the family. The appointment with these talented young Italians will be Thursday October 17th at the Pedregal Events Center, located in Belén. Selling points: www.specialticket.net, call center 2206-7770, Servimas Authorized Bansbach and Barbería. Celebrations across the country in honor of San Isidro, patron saint of farmers, blessing of animals and crops, parades and fairs. 300 performances by 2000 artists from Guanacaste and the region. Music, dance, theater and circus arts, exhibitions, workshops and book changes. The dance group Ex-Anima, songwriter Luis Angel Castro, Theatre Impromtu, actress Marcia Saborio, Cradle Swing, Dance Metamorphosis, Escats and the National Symphony Orchestra. We highlight a show with 25 marimberos from the entire Central American region. Also Pato Barraza, Mekatelyu, Lucho Calavera y la Canalla, Sonámbulo Psicotropical, The Movement In Codes, Saint Legion, Infibeat, Park in the Space, Octopi, Moldo, Patiño Quintana y Los Ajenos. Great concert for Trova lovers. Cuban singer Silvio Rodriguez is one of the founders of the movement called Nueva Trova that began in the '70s. Today at 66 years old, is very popular in Cuba and Spanish-speaking countries. EXPOTUR is the travel trade-mart of Costa Rica and the region, this year from May 8th to 10th for the industry visitors and a second part on 11 and 12 of May open to public. It offers all participants an excellent opportunity for finding new travel products and know a lot more about all regions of Costa Rica. EXPOTUR is the travel trade-mart of Costa Rica and the region, this year from May 8th to 10th for the industry visitors and a second part on 11 and 12 of May open to public. It offers all participants an excellent opportunity for finding new travel products and know a lot more about all regions of Costa Rica. With 28 uninterrupted years, it represents the best platform for those who want to put together a travel package containing excellent value, and at the same time receive a good return on their investment. This event, organized by the Costa Rican Association of Professionals in Tourism -ACOPROT - gathers more than 300 representatives of tourism companies in Costa Rica and the region. The variety and quality of tourism products and services is one of the major attractions for those who come looking for new products and programs for their clients. The participation of sellers of products and services, focused in different segments of the tourist trade, allows buyers to select the companies which will offer them the best selection of products for their needs. Thus, the supply of services to choose from include, airlines, hotels, car rentals as well as specific products such as sports activities, weddings and honeymoons, sun and beach activities, eco-tourism, adventure, medical tourism, holistic tourism, and many others. Much emphasis has been placed on meetings, incentives, conventions and exhibitions as well as corporate travel, educational tourism, senior tourism and cultural tourism. The sellers represent all the tourist regions of Costa Rica and Central American countries. The buyers consist of international wholesalers of three continents and in addition, some wholesale companies have been honouring us with their presence since the first edition of our event in 1985. This is without a doubt a sample of loyalty, effectiveness and the seriousness of EXPOTUR. Also, to get familiar with the innovations and the new tourism offers of the country, Post Tours are available to buyers, so that they may experience the variety and quality of products offered in the Travel-mart. The consolidation of the event, plus a professional organization guarantees effective and quality negotiations. Do not miss this opportunity to discover why EXPOTUR creates the perfect climate for you to connect with the best businesses of the tourism industry of the region. 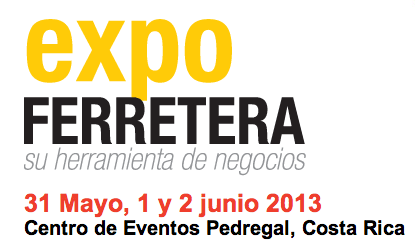 EXPOTUR is the travel trade-mart of Costa Rica and the region. EXPOTUR offers all participants an excellent opportunity for finding new travel products. An exhibition space and exchange between the main productive sectors of Costa Rica and the region, through a focused exhibition Metalworking companies, plastics, food, supplies, services and other manufacturing industries. During this fair, different companies from all industrial activities will showcase their products and share the opportunity to do business with other companies, nationally and internationally. • Industrial companies engaged in: Food and Beverage, Metalworking, Wood Products & Furniture, Non-metallic Mineral Products, Packaging, Textiles, Printing Industry, Chemicals and Pharmaceuticals, and other manufacturing industries. • Suppliers of machinery and equipment, supplies and services for the industry. • National and international buyers. • Exhibit Area (stands) and Metalworking Sector Showroom: will have 200 stands where companies can showcase their products to customers and potential buyers. In addition, we will Metalmecánico Showroom, a specially equipped hall for industries of this specific sector can exhibit their machinery in a comfortable and suits your needs. • Conference Program: to strengthen the four major themes for the Chamber of Industry and for industry in general, we decided to focus our conference program on the following topics: innovation, energy efficiency, and Human Resource Eco-efficiency. • Center for Creating Business Roundtable and Chains: The business conference aims to enable networking through business agendas between the participating companies and visitors buyers, both local and international. Through the program by creating chains, small and medium enterprises have the opportunity to generate business linkages with large national and transnational entities. First Edition of MAE Fest, a music, art and entertainment event full of national talents. Participaran más de 40 bandas Nacionales de diferentes géneros. Artistas de la moda y arte el arte tradicional, asi como circo callejero y demás expresiones artísticas invitadas al festival. The Philharmonic Orchestra presents: We Are Latinos!!! The Philharmonic presents Sabor Latino, a tribute to our music. Best of Hector Lavoe, Ruben Blades, Marc Anthony, El Gran Combo of Puerto Rico, Celia Cruz, Gilberto Santarosa, Juan Luis Guerra, and many more. 3 concerts will be held on 26, 27 and 28 April at the Teatro Melico Salazar. Exphore, Hotels & Restaurants Expo. EXPHORE is the meeting point where national and international suppliers exhibit their products and services for the gastronomic and hotel industry. We are visited by more that 4,000 people from all parts of the country as well as international visitors. · National and international buyer contacts. Presents their newest espectacular production: "Varekai"
30 functions will be present in Costa Rica the show "Varekai" . The story is loosely based on the Greek myth of Icarus, who is melting his wings after flying too close to the sun. He lands in a lush forest land, in which creatures will teach to fly again. the pre-sale of tickets has been very successful! Do not miss this opportunity. National meeting and exhibition of hardware stores, construction materials and industry/home equipment . Where: Pedregal Event Center, San Jose, Costa Rica. After 10 years of absence, the Rock Fest will return to Costa Rica with vengeance: 25 national rock bands who will unite to show off the local rock talent found Costa Rica dating back to the late 90′s and early 2000′s. This festival will be a rock music congregation of emerging groups as well as many already recognized groups. The news of the Rock Fest 2013 was released in a press conference held at the Intercontinental Hotel in Escazú where Ernesto Adduci revealed the details for the return of the festival and his intention for the festival to stay and hopefully become an annual event. There will be two platforms located within the stadium. One of the most successful songwriters Spanish international has an unforgettable concert. Sanz, an artist is much loved and admired by the Ticos. Costa Rica was included in the tour of South America and some cities in the United States. Spanish singer will perform singles from her latest album: The music is not played and some of his most successful song repertoire as broken heart. Without being structured in a musical line, their sets is defined by the House, traveling by Minimal, Electro, Progressive & Techno. Always characterized for his charism and also for to lead and interact with the people, doing a personal touch in each presentation. His official career began in December 1998 at the legendary and now disappeared club Whiskado. He traveled various clubs and events in South America as Ministry of Sound, Party Bahiona, House For Friends, Pacha (Bariloche), Genux, Cafe del Mar, Bora Bora, among others. 3 shows with more than 100 performers, including dancers, singers and musicians. A show with the highest level, which will have the main songs of Michael Jackson, all the successes of his career, even with the Jackson 5. Ensures Marvin Araya, director of the orchestra. The concert will feature nearly 100 performers, including dancers, singers and musicians.